Painter and illuminator. He trained in the workshop of Matteo di Giovanni, with whom he was associated from about 1470 to 1483 and with whom he is often confused. Early illuminations for the Antiphonals of Siena Cathedral (c. 1480; Siena, Biblioteca Piccolomini) and a number of securely attributed paintings demonstrate Guidoccio s development of a fine, distinctive style that reflects Tuscan and northern European as well as Sienese influences. 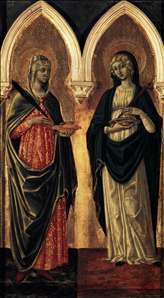 A scene from an Antiphonal depicting a Religious Ceremony (Siena, Biblioteca Piccolomini), a fragment of an altarpiece depicting the Annunciation and the Journey to Bethlehem (Coral Gables, Lowe Art Museum) and a cassone panel depicting the Legend of Cloelia (New York, Metropolitan Museum of Art) all combine masses of rusticated and classical architectural structures into perspective vistas. The dense cityscapes are played off against open sky and landscape, while porticos, gateways and vaulted spaces form the stage on which tactile and sprightly figures re-enact religious drama or ancient legends. In the Baptism of Christ with SS Jerome and Augustine (1470; Sinalunga, S Bernardino) the deep, panoramic landscape and triad of angels suggest Umbrian influences. A connection with Piero della Francesca through Matteo di Giovanni is possible. See more details about "Sts Agatha and Lucy"